Miguel Petchkovsky was born in 1956 in the North-East of Angola. He belongs to the Thockwe ethnic group, the main population of that region. He started his artistic career in 1980 as a filmmaker for the AIC – Angolan Cinema Instute. From 1987 until 1992 he studied painting at the Rietveld Academy in Amsterdam, the Netherlands. After his studies he experienced a wide range of other creative areas, such as photography, sculpture and conceptual installations. 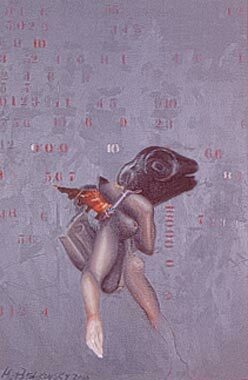 Petchkovsky frequently uses recycled objects and materials in his works. African life or history is often symbolized or implied in his works.